Last week’s Jimmy Fallon-hosted Saturday Night Live provided the season’s most talked-about episodes, demonstrating that the show is still capable of producing watercooler moments so long as it invites back as many former cast members as it can possibly cram into 90 minutes. But the one sketch everyone seemed to be discussing was the one about Tim Tebow, because currently 75 percent of all human dialogue is devoted to discussing Tim Tebow. 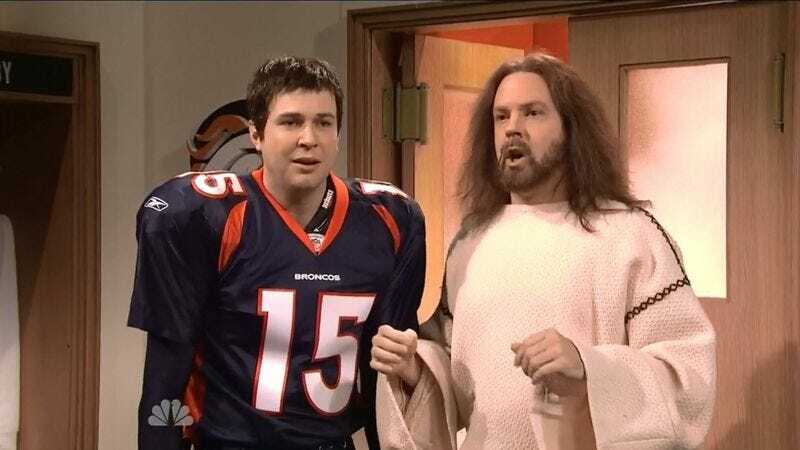 For those who missed it, Tim Tebow is very Christian and sometimes it’s funny just how Christian he is and—well, we won’t spoil it, as you can check it out below. Anyway, look, Pat Robertson likes a good joke as much as the next humorless, anachronistic televangelist who seriously believes that 9/11 was caused by liberals and gays and that Haiti was destroyed because it’s in league with the devil, but what he can’t chuckle at condescendingly is any implication that blind Christian zealotry is amusing. Robertson once more took to his basic-cable mount on the Christian Broadcasting Network and delivered a sermon calling the SNL sketch an example of “an anti-Christian bigotry that is just disgusting,” noting, “If this had been a Muslim country and they had done that, and had Muhammad doing that stuff, you would have found bombs being thrown off! And bodies on the street!” Indeed, the writers of Saturday Night Live are just lucky that Christians have never used their religion to justify violent retribution, and don’t have any grandstanding religious leaders who regularly use fear and persecution as motivators.